2019 NFL Draft rumors: What's real, and what's fake news? We’re at the height of NFL Draft rumor season around the league. Less than two weeks until the annual event in Nashville, and the football world’s water cooler is going absolutely crazy. How many teams will go quarterback in Round 1? Will the Arizona Cardinals actually go this position early for the second consecutive year? The draft’s top overall prospect has made changes to his PR game. Does this mean he’s going to land in San Francisco or will the 49ers avoid him? Here, we check in on the top rumors surrounding the 2019 NFL Draft and decide whether they are real or actual fake news. Real: Cardinals will take Kyler Murray No. 1 overall. In this case, the smoke is just as hot as the fire. Arizona has not shown any real interest in downplaying its love for Murray. That was magnified this past week when the team prevented Josh Rosen from showing his face while Murray was visiting in Arizona. We know all about the Kliff Kingsbury/Kyler Murray connection. There’s no reason to believe Arizona’s brass won’t cater to its hot, young head coach. Sometimes, rumors are rumors. They start for a reason. These rumors just didn’t come out of left field. Murray to the Cardinals is a near certainty. Period. Fake: Only one wide receiver will go in the first round. Recent suggestions from draft insiders are that only one receiver will go within the top-32 picks. Given how deep this draft is at wide receiver, we’re here to throw cold water on that idea. In fact, a half-dozen pass catchers could go on Day 1. Let’s assume D.K. Metcalf is a lock after his dominant Scouting Combine performance (he is). This means only one other receiver would have to break the top 32. A.J. Brown (Georgia), Hakeem Butler (Iowa State), Deebo Samuel (South Carolina), N’Keal Harry (Arizona State) and Marquise Brown (Oklahoma) would all have to fall out of the top 32. That’s not happening. Real: Raiders seriously considering quarterback in first round. Oakland’s brass has met with both top quarterbacks, Kyler Murray and Dwayne Haskins. You don’t give multiple quarterbacks top-30 visits without being interested in the position. Despite what they might want to tell us publicly, the Raiders are not sold on Derek Carr as a long-term fixture. He apparently knows this very well. Selecting No. 4 overall and with two other first-round picks, Oakland has the capability to move up should it target Murray and/or Haskins. We know very well Jon Gruden is molding this team in his way. He has not seen eye-to-eye with Carr in the past. Couple in an impending move to Vegas, and starting anew at quarterback could make sense. Fake: Redskins only looking at rookie quarterback options. The Redskins were not interested in drafting a quarterback until they were. President Bruce Allen and Co. were sold on Case Keenum/Colt McCoy pairing until they weren’t. What does this tell us about the nation’s capital? Washington has absolutely no idea what it’s doing at quarterback after Alex Smith suffered a potential career-ending injury last season. What we do know is that the Skins have been linked to Cardinals quarterback Josh Rosen more than any other team. That’s what makes this a bit of news fake. Washington is creating leverage in a potential Rosen trade by hosting prospects. The team will end up trading for him on draft day. Real: Jets urgently looking to trade down. Last season saw the Jets trade three second-round picks in a move up from No. 6 overall to the third pick for Sam Darnold. That was a lot to pay for a franchise quarterback. We now know that the Jets are looking to move down from the third spot this April in an attempt to fill other holes on their roster. Given New York’s needs are primarily along the offensive line, at receiver and pressuring the quarterback on defense, this seems to make a lot of sense. The Jets could still get a top-end pass rusher such as Brian Burns (Florida State), Montez Sweat (Mississippi State) or Clelin Ferrell (Clemson) in a trade down. This would enable them to fill more holes later in the draft. Fake: Giants to avoid quarterback in the first round. Surprisingly, the Giants took a visit with Kyler Murray earlier in the week. The team was said to be very low on the reigning Heisman winner. We’re hearing that New York might commit to Eli Manning for the 2020 season. Crazy stuff, right? Even if that’s the case, general manager David Gettleman needs to give his fan base something to be excited about. This could potentially include a move up from the sixth spot, yielding the first-round selection New York acquired in the Odell Beckham Jr. trade, for either Murray or Haskins. More often than not, leaks from various organizations during the pre-draft process tell us nothing. New York’s previous disinterest in quarterbacks was nothing more than a smokescreen. Real: Jachai Polite will fall to Day 3. This former Florida pass rusher was considered a legit top-20 prospect prior to the NFL Scouting Combine. Unfortunately, Polite had one of the worst performances we’ve ever seen at the combine. He ran a disastrous 4.84 40-yard dash and struggled big time in individual drills before pulling up lame to injury. Polite then complained about teams being too critical of him during interviews. That’s not going to sit well with squads around the NFL. Couple in another bad performance at Florida’s Pro Day, and we would not be surprised if Polite were to last until the end of Day 3. That’s if he’s even drafted at all. Fake: 49ers to avoid Nick Bosa due to political beliefs. Bosa to the 49ers seem like a natural fit. Sure the team added Pro Bowl pass rusher Dee Ford in a trade earlier this offseason. But adding two elite level edge rushers would be a boon for this team. At issue here is recent and not-so-recent social media activity from Bosa indicating his preference for President Donald Trump and MAGA. Politics and sports. How fun. 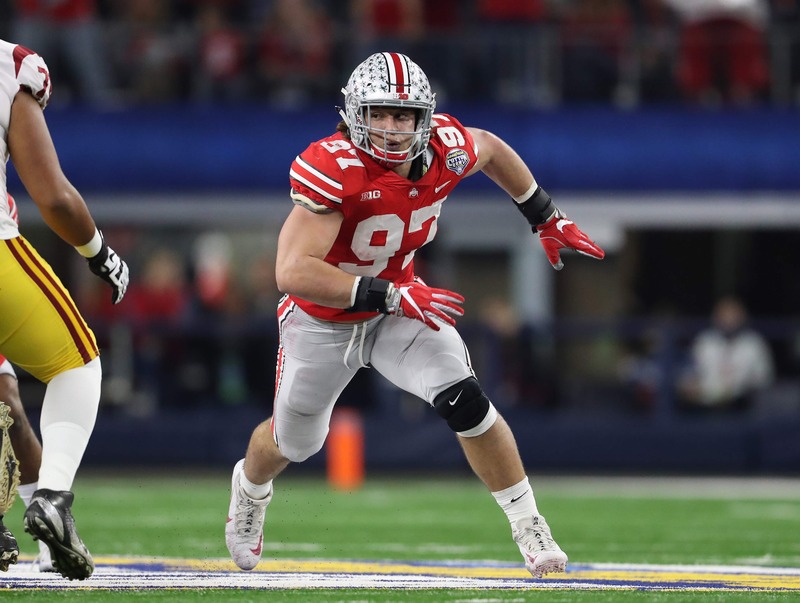 Should it matter what Bosa believes? Much like Colin Kaepernick, we firmly believe it shouldn’t. He has not hurt anyone. The dynamic here is San Francisco’s liberal-leaning front office and the demographics in the Bay Area. In the end, we firmly believe it won’t matter. Bosa is a perfect fit and seems to be of good character. San Francisco will run to the podium for Bosa once on the clock.